by Craig Sears, Owner & President of Sears Pool Management Consultants, Inc.
Fall is here, and experts recommend this is the best time to renovate your pool for several reasons. Contractors are less busy in the Fall, scheduling work is easier, and there is no time crunch if you encounter an issue that delays the project. Although Spring is the most popular time to complete pool renovations, it is also the most challenging, due to unpredictable weather, skilled labor is in high demand, raw materials are often in short supply and backorders can occur. An unexpected issue can cause a delay in opening the pool, which is frustrating for everyone. If possible, avoiding the Spring rush is definitely the smart way to go. Most commercial pools are surfaced with marcite or white plaster, which lasts 7-10 years, depending upon the quality of installation and your water chemistry. If you’re looking to upgrade your surface, consider quartz or pebble. Quartz surfaces offer a 10-14 year life expectancy, at a premium of roughly 40% over plaster. The finished product looks like white plaster with quartz crystal in it. The quartz can be colored to add color and sparkle to the water. Brand name quartz products often come with a special additive that makes the plaster itself more durable. This is a key difference between contractors using brand name products versus contractors who simply mix quartz crystal with regular white plaster. Pebble offers 15-20+ years of life expectancy at a premium of roughly double the cost of white plaster. Most counties restrict usage of darker colors and rough aggregate, so your options in quartz and pebble products will be limited for commercial pools. Brand name products typically offer longer product warranties than those custom blended on site by an installer. Pools that are rectangular or junior Olympic (racing lanes for swim team) in size, will look good with a quartz surface upgrade, but a pebble surface does little to enhance the look of the pool. You will get maximum benefit (longevity and aesthetic) out of a pebble surface when you have a freeform shaped pool, because it will give the pool a more natural look. While white plaster has a smooth feel to it, quartz is slightly rougher and becomes rougher and more aesthetically pleasing as the product ages, because more of the quartz becomes exposed. Pebble has a bumpy texture, because it literally contains pebbles that are exposed in the mix. It also becomes more textured and aesthetically pleasing as it ages. Resurfacing with pool paint is not recommended, unless there is no other option. Pool paint is less expensive initially, but only lasts 3-5 years, depending upon the type used. The real problem with pool paint is that when you want to return to a plaster, quartz, or pebble surface, the paint has to be sandblasted off first, which is an added expense. Paint can be used as a temporary band aid, but you will wind up spending more in the long run. Paint can be an effective coating however for beach entry pools, where plaster products should not be applied, because they would dry out. Unless your pool is experiencing settling or shifting, your waterline tile should last a long time, usually 2 life cycles of the plaster on your pool surface. Over time pool tile glaze wears off, making the tiles harder to keep clean. It’s more cost effective to replace your waterline tile with your plaster. Waterline tile offers a big aesthetic improvement factor, because this is what your bathers see from inside the pool. Lighter colors of tile show dirt more easily and tend to look dated. Darker colors and some patterns offer newer and fresher looks. 6”x 6” tiles are typically the most economical and sturdy option. 3”x 3” tiles are smaller have more grout lines, which show dirt more easily and can become weak spots for cracking if there is movement in the coping or deck. Coping is the part of the pool deck that starts at the edge of the pool and usually extends 12” back toward the deck. Coping options include poured concrete, brick, coping stones, and some natural stone. When selecting a material, consider what compliments your clubhouse/pool house and surroundings. As with other products, darker colors and some natural stones are prohibited by county health departments. You may have heard the adage, “All concrete cracks, it is just a matter of when and where.” The adage is true, so the best way to prevent cracks is to control them and predict them. We do this by installing expansion and control joints at proper intervals. Concrete expands and contracts with the temperature. The larger the deck and wider the temperature swing, the more the deck will move. You can expect your deck to move ¾” for every 10’ of concrete. Due to the wide temperature swings we experience in this part of the country, it is recommended that expansion or control joints be installed every 8-12 feet. Unless your deck is a monolithic pour (combined deck and coping), you should have a coping/deck joint to allow for expansion and contraction. Coping/deck joints should be about ½ – ¾“ wide to allow for expansion and contraction without damaging the deck, coping, or tile. Wider joints are not necessarily better. Extra wide mastic joints fail prematurely due to concrete contraction, and deck chairs legs can puncture holes in them. If you’re considering renovating or replacing your deck, that is the perfect time to address any drainage issues you have with your deck. You can adjust the pitch of the deck or install new deck drains. Textured surfaces on decks are becoming increasingly popular. They offer a resort like look and a more comfortable, cooler surface than regular concrete. Are your main drains VGB compliant? You may recall that your pool had to become compliant with the new federal law by Spring of 2009. What many did not realize is that the equipment has an expiration. Depending upon the brand and model, these suction fittings expire in 5, 7, or 10 years. Many of the most popular models expired after 5 years. If your main drains have expired, this does not mean they will fail, but it does mean that you are out of compliance, and should replace them with updated drain fittings. It is also a good time to verify that you are compliant in other areas of the VGB Pool and Spa Safety Act, including sump depth and skimmer equalizer fittings. Adding water features like mushrooms and waterslides can be exciting! They are also expensive and time consuming projects. Before embarking on such a project, poll the community to find out what features would be most popular and which features residents would be willing to pay for, if an assessment is needed. Consider the age demographics of your community, and ask your pool management company to provide age appropriate feature options. A qualified contractor should have years of experience in the industry with verifiable references. They should be able to tell you whether or not your pool is compliant with local, state, and federal codes, and if not, what you need to do to become compliant. They should be an APSP member. 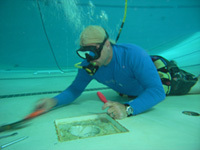 APSP is the Association of Pool and Spa Professionals. It is the industry trade association, and requires all members to sign a code of ethics. Unfortunately, not all contractors in the swimming pool industry are qualified or reputable. A licensing test is not required by the government or industry. Subcontractors come and go regularly in the swimming pool industry. Most pool renovation contractors offer a standard 1-year warranty on most work. This is usually sufficient, because if shoddy work was completed, a problem will usually surface within the first year. Some companies offer extended warranties, especially on quartz and pebble surfaces. However, warranties can be confusing. Ideally you want to have an installer’s warranty and a manufacturer’s warranty. An installer’s warranty is only as good as the company installing it. If that company goes out of business, that warranty is void. A manufacturer’s warranty sounds better in theory, but typically speaking manufacturers will only provide replacement materials under their warranty. Those replacement materials still have to be installed, which is why you also want an installer’s warranty. In addition, in order to be eligible for a manufacturer’s extended warranty, manufacturers sometimes require the installer to be an “approved applicator.” If the contractor is not on the manufacturer’s approved applicator list, the manufacturer will not honor the extended warranty, even if the contractor states that in his proposal. There are three key benefits in hiring a qualified pool management company to complete a pool renovation for you. They should know who the reputable contractors are. They should have established relationships with their subcontractors and receive wholesale pricing from them. Finally, if a subcontractor goes out of business and there is a warranty issue, your pool management company is another layer of protection for the association, because they are still obligated to honor that warranty, even if it means finding a different subcontractor to complete a warranty repair. Here is to making your community swimming pool a more beautiful amenity for your residents to enjoy. Happy renovating!